First introduced in 1970, the compelling art deco imagery in this now-classic tarot deck brought medieval tarot symbolism into the modern Aquarian age. Aquarian Tarot has remained a bestseller throughout the four decades it has been in print and still resonates today with those seeking transformation. David Palladini was born in Italy but came to the United States at an early age and grew up in Highland Park, Illinois. He studied art and design at Pratt Institute in Brooklyn, New York. A graphic artist, Palladini has designed and illustrated books, posters, magazine covers and tarot decks. In addition to the Aquarian Tarot, which has been in print for over 45 years, he also created the popular New PalladiniTarot. 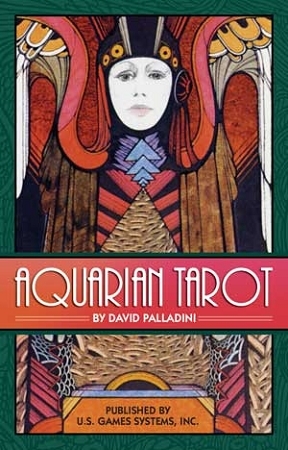 Palladini co-wrote Painting the Soul: The Tarot Art of David Palladini. Mr. Palladini illustrated The Eyes of the Dragon By Stephen King, Twenty-Six Starlings Will Fly Through You Mind by Barbara Wersba, and The Prince in the Golden Tower by Florence Karpin. He has won numerous awards from such international groups as the American Institute of Graphic Arts, the New York Society of Illustrators, and the Bratislava Biennale. He now lives in southern California, where he is a photographer and musician.